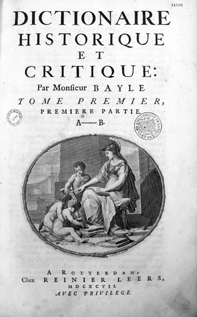 Eighteenth-century Paris was a vibrant centre of scholarly activity, publishing, and consumption. As the number of printed works multiplied, the demand for condensed up-to-date summaries of all fields of knowledge increased. In my book The Maurists’ unfinished encyclopedia I tell the story of a hitherto unknown encyclopedic project that was being developed in Paris at the same time as Diderot and D’Alembert’s Encyclopédie. While the latter became a controversial but successful bestseller – often considered to be the medium of Enlightenment thought par excellence – the former never reached the public. The compilers were Benedictine monks of the Congregation of Saint-Maur, also known as Maurists. After ten years of work, they abandoned their encyclopedic enterprise. Decades later, after the French Revolution and the dissolution of all religious orders, the surviving manuscript found its way to the new national library, the Bibliothèque nationale de France. For the next 160 years, though, it escaped the attention of researchers. Uncovering the history of the Maurist encyclopedia became something of an academic detective story. I first laid my hands on the manuscript in 2009 after coming across, two years earlier, a curious piece of information that eventually led me to the BnF. It was a congregational report briefly noting that two monks in the Parisian abbey of Saint-Germain-des-Prés had worked on a ‘dictionnaire universel des arts méchaniques et libéraux, des métiers et de toutes les sciences qui y ont quelque rapport’. Their names were Dom Antoine-Joseph Pernety and Dom François de Brézillac, and the report was dated 1747. 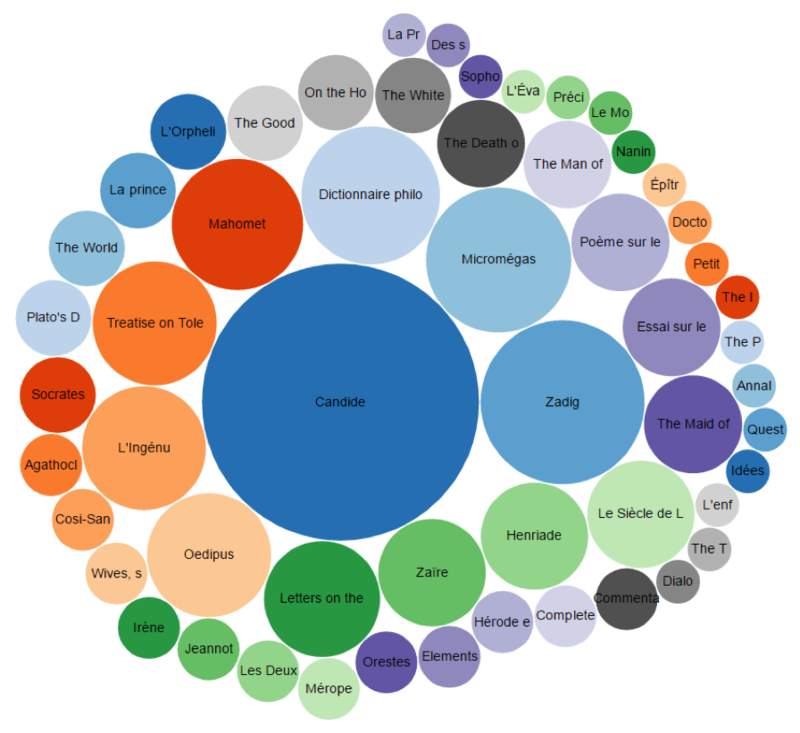 This was the same year in which Denis Diderot and Jean D’Alembert became editors of the embryonic Encyclopédie. Moreover, the monks’ abbey was located just a few hundred meters from the Café Procope, the favorite meeting place of the encyclopédistes. In other words, two large-scale encyclopedias were initiated at the same time, in the very same quarter in Paris, but only one of them would make it to the printing press and into the history books. 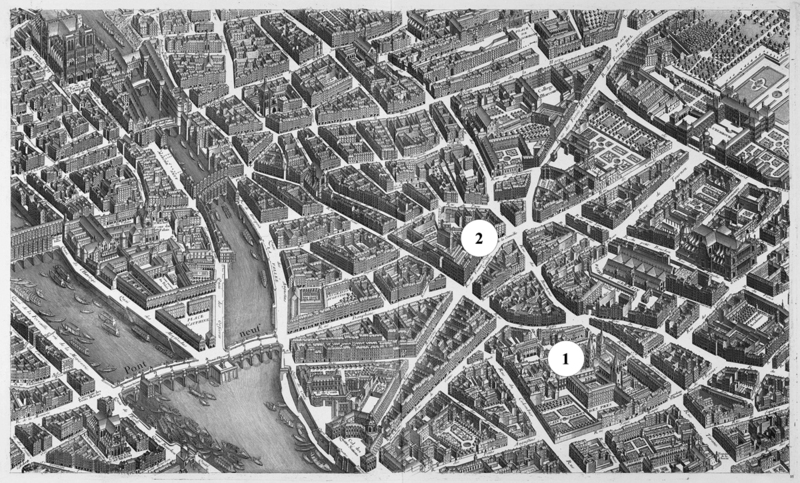 The Left Bank of Paris in the mid-eighteenth century: the location of the abbey of Saint-Germain-des-Prés (1) and the Café Procope (2). There was no record of a Maurist encyclopedia ever being published and I had not found a single mention of the project in earlier research on the Congregation. Therefore I initially suspected that the work had been abandoned at an early phase and had thus been too short-lived to produce any text. Two years later, when I traced down the surviving material at the BnF, I quickly revised my assumption. The collection amounted to six volumes in-folio. Clearly, this project had been in progress for quite some time before the writers put down their quills. So, what had happened? What kind of encyclopedia had these monks been making? And how had their vision compared to the contemporary work of Diderot and D’Alembert? It took me four years following up on many clues to answer these questions. The Maurist manuscript was uncharted territory. The collection had no title page or explanatory preface. There were no signatures stating the names of the compilers or any information on their number. 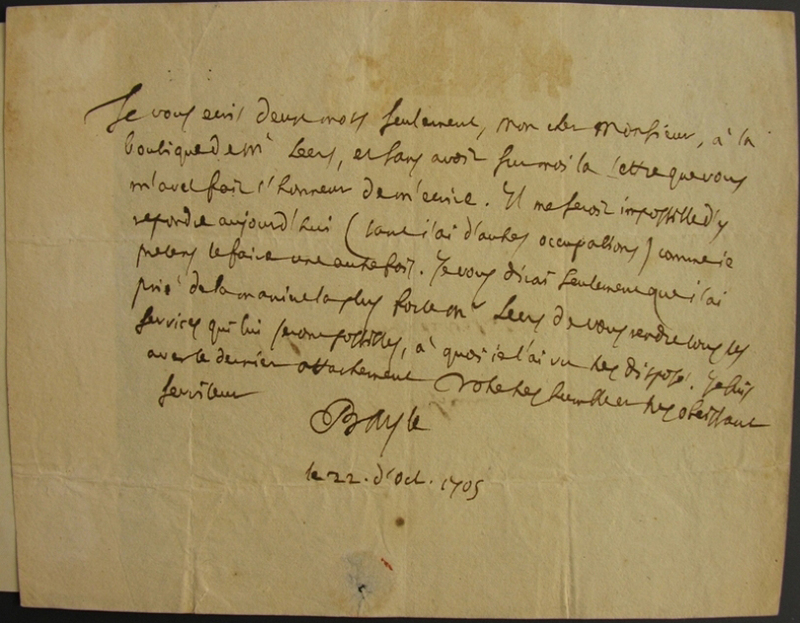 The handwriting, however, suggested contributions from more than two individuals. Furthermore, some textual parts were elegantly rewritten while others were merely scribbled drafts. Indications of missing pieces cropped up here and there. One volume contained what seemed to be a discarded early version of the project; another consisted only of ‘working lists’, such as inventories of literature and illustrations. Then (as if things were not complicated enough), I discovered that the whole manuscript had been rearranged at the BnF in the mid-nineteenth century. I also learned that as much as a third of the original material could have been lost. Thus, what I held in my hands was not a finished manuscript preserved in its original state, but rather the incomplete remains of a dictionary abandoned in the making, later ordered and altered by uninitiated hands. 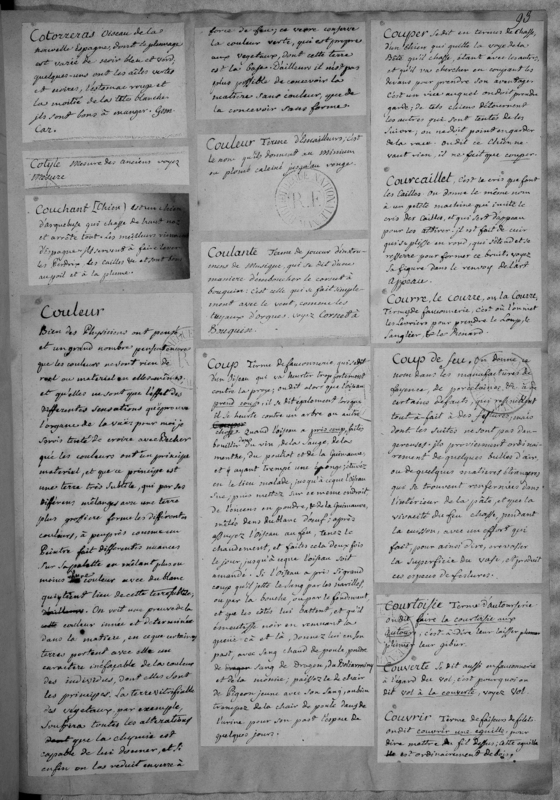 A page from the Maurists’ unfinished encyclopedia, showing a collage of articles rearranged by the conservators at the BnF in the mid-nineteenth century. 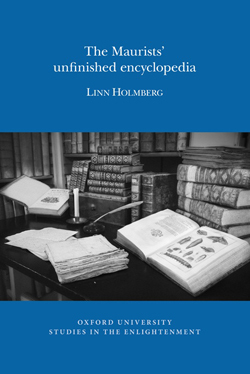 The Maurists’ unfinished encyclopedia is just as much about overcoming the methodological challenges of studying incomplete, unfinished texts as it is a history of an unrealized scholarly enterprise. By combining clues from handwriting analysis, codicological examination, extensive textual comparisons and archival work, I demonstrate that the Maurist enterprise began life in 1743 as an augmented translation of a foreign lexicon – a mathematical lexicon by the German philosopher Christian Wolff. Due to competition with the embryonic Encyclopédie in 1746, the conditions for the monks’ work changed and the scope of their project expanded. Like the encyclopédistes, the Maurists devoted great attention to the mechanical arts and they planned for a great number of illustrations. By excluding religion, politics and ethics, the monks created a secular, non-confrontational reference work that focused entirely on the productive and useful arts, crafts and sciences. In this respect, Diderot and d’Alembert were not alone in their encyclopedic innovations and secular Enlightenment endeavors, although they certainly were the most successful. 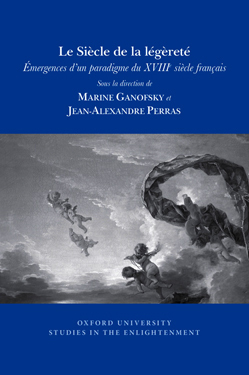 Abandoned in the mid-1750s – in the midst of the controversy surrounding the Encyclopédie – the Maurist enterprise may have made little difference to its contemporaries, but it does, however, make a difference for our present understanding of mid-eighteenth-century encyclopedism in France, the perceived novelty of the Encyclopédie, as well as the intellectual activities of the Congregation of Saint-Maur. 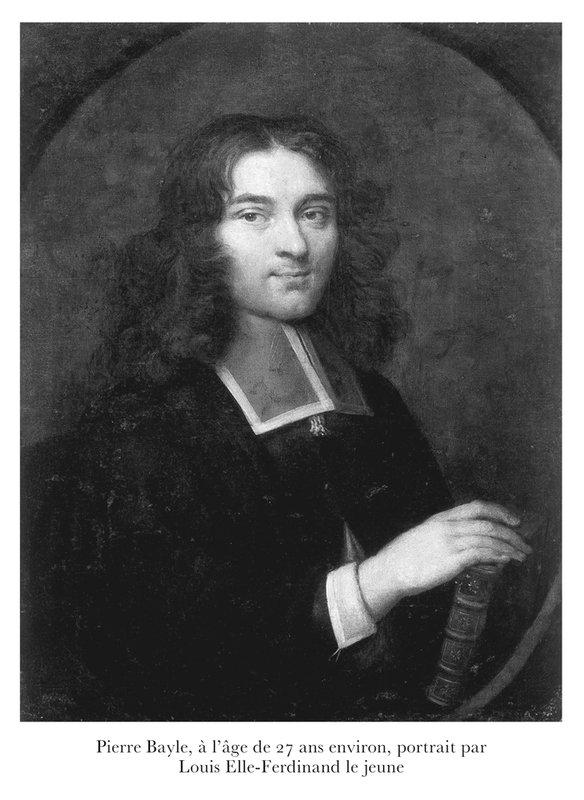 Edmond Martène, Histoire de la Congrégation de Saint-Maur, ed. Gaston Charvin, 10 vol. (Paris, 1928–1954), vol.9 (1943), p.342.